Ten Speed Press, 9780399578427, 352pp. From the author of the brilliant A Modern Way to Eat, who was dubbed "the new Nigella Lawson" by The Times, comes this beautiful collection of 150+ delicious and inspiring weeknight vegetarian recipes. EATING HEALTHY ISN’T ALWAYS EASY when you’re coming home late at night and tired. In this genius new collection of vegetarian recipes, author Anna Jones tackles this common problem, making nourishing vegetable-centered food realistic on any day of the week. The chapters are broken down by time, with recipes that can be prepared in under 15, 20, 30, and 40 minutes, so no matter how busy you are, you can get dinner on the table, whether it be smoky pepper and white bean quesadilla, butternut squash and sweet leek hash, or chickpea pasta with simple tomato sauce. With evocative and encouraging writing, A Modern Way to Cook is a truly practical and inspiring recipe collection for anyone wanting to make meals with tons of flavor and little fuss. ANNA JONES is a cook, food writer, and stylist. She worked for many years as part of Jamie Oliver’s food team—styling, writing, and working behind the scenes on books, TV shows, and food campaigns—and went on to work with some of the UK’s biggest food brands and best-known chefs. She is the author of A Modern Way to Eat, widely acclaimed as a book of the year. A Modern Way to Cook is her second book. She lives, writes, and cooks in Hackney, East London. "A group of fashionable young women in Britain are making a career of promoting healthy eating, including Jasmine and Melissa Hemsley, Amelia Freer, Anna Jones and Natasha Corrett. The Guardian has called them 'the queens of greens'; The Telegraph named them 'the superfoodies.' One could also think of them as the Daughters of Nigella, the logical successors to Nigella Lawson." "Anna Jones taps the sweet spot between healthfulness and downright decadence with inventive vegetarian dishes such as beet-and-radicchio gratin. Her fuss-free style helps busy cooks get dinner on the table in as little as 10 minutes, 40 max." "Rather than separate recipes by course, Jones breaks the chapters into prep time. That way, you know right where to go for need-dinner-now crispy cauliflower rice and where to flip for a more leisurely project like butternut-cannellini gratin. While the dishes are all vegetarian, it’s comforting to know that “modern” cooking can still include desserts like cookie dough bars and panna cotta." "Whether you’ve been vegetarian for years or are new to the lifestyle, this stylish cookbook is the perfect modern guide to meat-free dining. With a sumptuous collection of over 150 recipes, you’ll be cooking veggie-packed meals on weeknights in no time. 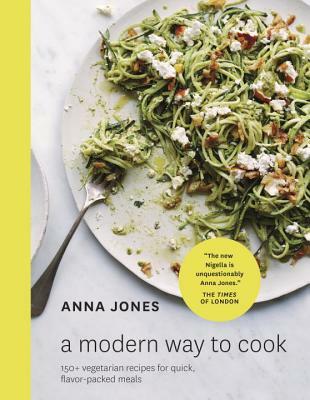 Author Anna Jones was one of the originals in Jamie Oliver’s apprentice kitchen, Fifteen (also dubbed the new Nigella Lawson by The Sunday Times), and eventually became his food stylist. Since going vegetarian at 25, she’s developed a tasty repertoire and, thankfully, compiled them all in this handy cookbook. Jones makes eating healthy easy."